FIle photo of young chicks at the Armiger Family Farm in Pittsfield are being raised to become meat chickens and laying hens. A sure sign of spring in farm supply stores and barnyards across Maine is the arrival of days-old poultry chicks. Tiny, fuzzy and undeniably cute, the baby birds seem to beg to be held, cuddled and petted. But health officials and fowl experts warn that all that cuddling can have some serious health risks if proper care is not taken. 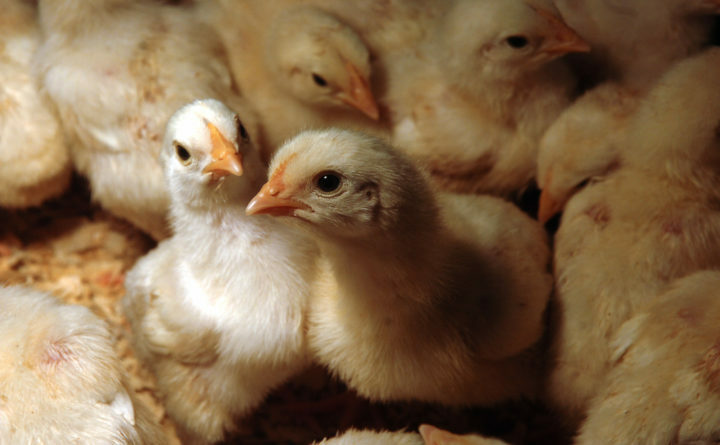 The biggest risk to human exposure to chicks is salmonella, a bacterial disease that affects the digestive tract. The Centers for Disease Control estimates salmonella causes about 1.2 million illnesses, 23,000 hospitalizations and 450 deaths in the United States every year. Most persons infected with salmonella develop diarrhea, fever and abdominal cramps 12 to 72 hours after infection. The illness usually lasts four to seven days, and most persons recover without treatment. But in some people — especially the very young, the elderly and those with compromised immune systems, the symptoms may be so severe that the patient needs to be hospitalized. Since the germs can also drop off the fowl onto their cages, bedding, feed and eggs, Mills said it is important to practice good hygiene anytime a person is in an area inhabited by poultry. At the Tractor Supply Store in Madawaska, last week’s shipment of layer chicks were peeping up a storm in their cozy, heated brooders behind the customer service desk. Employees follow strict rules to prevent well intentioned customers who want only to cuddle a soft bird from doing so and are careful to follow a rigorous hygiene protocol after handling the birds themselves. What is new, she said, is technology that has allowed health professionals to track and identify exactly where the disease-causing microbes were coming from.